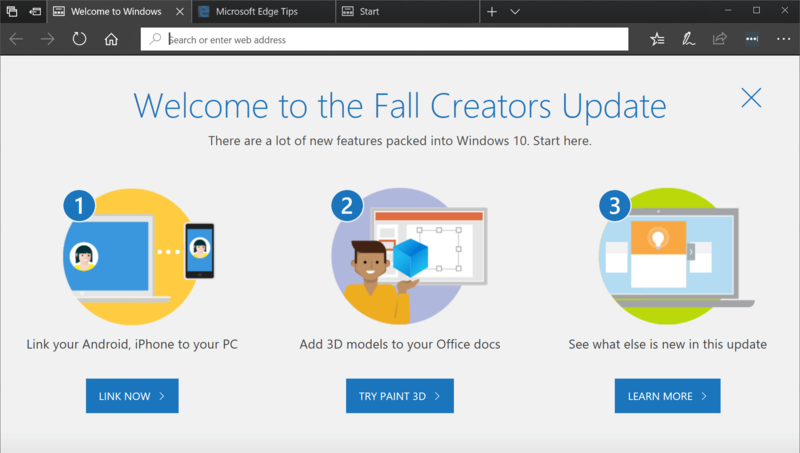 Microsoft started rolling out the Fall Creators Update this morning to Windows 10 PCs worldwide. As usual, the roll out will be in phases, with newer machines receiving it first as an automated update, or if you check manually and your PC is eligible for this first phase, it will download and install it (version 1709) right away. The update is launching roughly six months after the first major Creators pack, containing a number of fresh features in addition to the usual bug fixes and security patches. The Start menu has been slightly improved to enable grouping of app tiles into folders by grabbing and dropping a tile on top of another, similar to how you group together apps in your smartphone. Other small usability settings include better Personalization options, so you can modify the color of the UI and Windows will remember previous themes used, so you can go back and forth easily. A new night light setting shows warmer colors to rest your eyes at night -- similar to what flux does (highly recommended) but now built into the operating system. Also debuting on the Fall Creators Update are the first hints of Fluent Design, an effort to make the Windows UI, styling and themes more unified across apps and interfaces. The changes are subtle, but this should work nicely in combination with improvements for high DPI screens touted on this update. OneDrive is receiving an overhaul to bring files on-demand. Folders and files will be able to selectively be downloaded so that local disk space will not be eaten up by rarely used data. For those wondering about the now obsolete Windows Movie Maker, a new app called Story Remix will serve as a replacement to provide basic multimedia creation and editing. Images and videos can be dropped in, rearranged and easily turned into a suitable output format. The global Windows Settings have also been fine-tuned to make searching simpler. Apps and Gaming now have their own settings categories. Windows Defender is now "Windows Defender Antivirus" showing some new visual cues across the OS. Microsoft Edge and Cortana are getting several new features and updates, even though many users don't take full advantage of them or simply disregard them (most in favor of Chrome or Firefox), Edge is slowly turning into a robust and flexible browser. It will be a hard road to make it a popular choice among users though. Along with the Fall Creators Update, Microsoft is opening up Windows Mixed Reality and a range of mixed reality headsets started shipping today from the likes of Acer, Dell, HP and Lenovo, starting at $399 including motion controllers. A Samsung headset that uses AMOLED screens instead of LCD will sell for $499 later this year, too. Cloud-based clipboard support is making its way to Windows as copying from a Windows 10 device to a mobile phone or tablet will eventually be possible. This feature will likely work similarly to the Apple Universal Clipboard that connects macOS and iOS, while Windows 10 will support iPhones and Android handsets. Microsoft also announced new Surface Book 2 laptops to coincide with Windows 10's latest major update.